A cultured milk beverage, which originated in a mountainous region of Eastern Europe and western Asia known as the Caucasus. 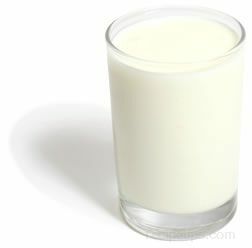 The milk first used to make this beverage was camel's milk but today the milk most often used is cow's, goat's or sheep's milk. Kefir, which is similar to a liquid yogurt, contains strains of bacteria and yeast considered beneficial to the body. Unlike yogurt, kefir contains Lactobacillus Caucasus, Leuconostoc, Acetobacter, and Streptococcus species of bacteria as well as Saccharomyces and Torula kefir, which medical researchers believe serve as a means to fight off harmful bacteria and yeasts affecting the body. Kefir also contains a significant amount of Tryptophan, which is an essential amino acid that provides a calming affect on the body. The use of kefir is considered as an effective way to build immunities in the body and help the digestive system, keeping it free of some common digestive disorders. The bacteria and yeasts that become cultures for kefir are grown by allowing raw milk to remain at room temperature for approximately 18 to 24 hours, watching it carefully so it is not allowed to become lumpy or sour, but instead smooth and creamy. Gelatin-like granules form that contain the beneficial species of bacteria and yeast, as well as other healthy elements such as sugars and proteins. The contents of these granules ferment the milk and are then strained away and used to create another batch of milk. Providing a slightly sour flavor, kefir can be served as a healthy beverage, or added to other flavored milk drinks such as smoothies, or become a liquid accompaniment for use with fruit and granola, or used as a base for dips and salad dressings.